Fig 3. Double ozone hole on September 25, 2002. NASA EP/TOMS Total Ozone map, retrieved 2015, available. Arrow symbol has been added at the location of the South Magnetic Pole. If paramagnetic oxygen migrates, then the global atmospheric nitrogen/oxygen ratio will not retain the familiar well-mixed 78/21 percentages. Detailed study and comparison of the following three NASA map sets yields exceptional proof and understanding of the conversion of paramagnetic oxygen to stratospheric ozone at the magnetic poles. NASA, Jet Propulsion Laboratory (JPL), California Institute of Technology (CIT), Earth Observing System (EOS), Microwave Limb Sounder (MLS) issued a series of maps derived from their data from the Aura satellite on September 21, 2005 (2005d264). “The Microwave Limb Sounder (MLS) experiments measure naturally-occurring microwave thermal emission from the limb (edge) of Earth’s atmosphere to remotely sense vertical profiles of atmospheric gases, temperature, pressure, and cloud ice. The overall objective of these experiments is to provide information that will help improve our understanding of Earth’s atmosphere and global change.”. The following EOS Aura MLS figures were retrieved in 2014 from the NASA internet presentation, but in 2015 they were not readily available from the previous URLs. 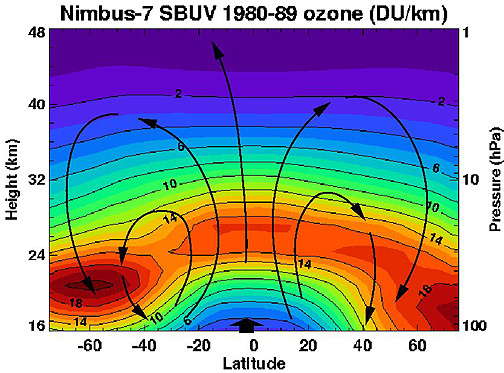 The recorded maps, however, are reliable evidence supporting the thesis of paramagnetic oxygen transport to high-latitude conversion into stratospheric ozone, and the detailed MLS data may be obtained from NASA. The MLS Temperature Product (Fig 16) “measures temperature – primarily – from thermal emission by oxygen, which is well mixed with a known atmospheric mixing ratio”, a proxy by NASA/JPL/CIT. If the premise of a well-mixed 78/21 nitrogen/oxygen ratio is thrown out, then taking the proxy at face value, these are maps of thermal emission by oxygen. These are maps of the oxygen accumulations predicted by the paramagnetic oxygen transport thesis.